Meeting with Tom Twetten (’57 psychology), you get the distinct feeling that there’s much more to his story than he’s telling you. Living in some of those countries in the 1970s, he developed an interest in the preservation of rare books. Twenty years later, he took a night class on bookbinding and found that he had a talent for creating artistic leather bindings. He and his wife, Kathryn, already liked New England, and they decided to locate “far away” – in terms of both geography and culture – in the tiny village of Craftsbury Common, Vt.
“The second part [of retirement] was to do something entirely different,” he said. 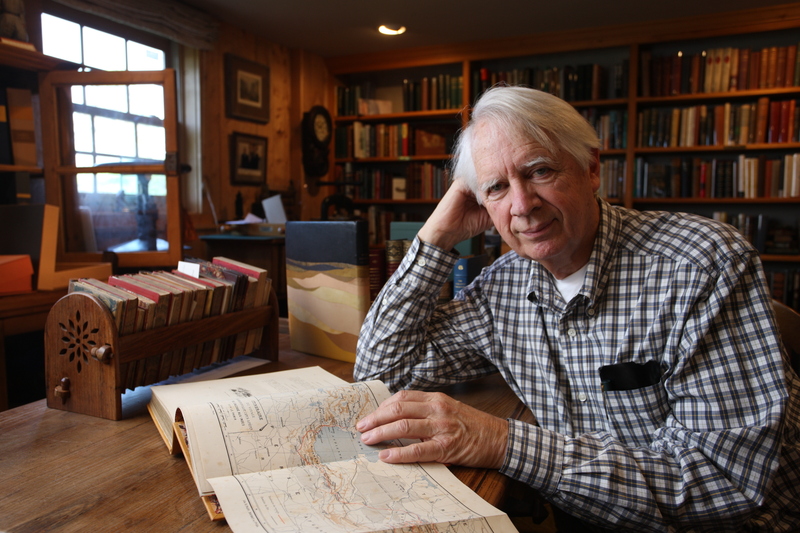 Tom launched Craftsbury Antiquarian Books in the basement of his 19th century home. It’s a business in which he both buys and sells rare books – focusing on travel, art, archeology, military, and culture – and also binds books with his own artistic designs. He says the book business is perfect for retirement. He can work as much or as little as he wants – for a day or an hour. “I can go visit grandkids and take a book to work on,” he says. It’s a quiet life that seems so counter to his top-secret government career that one can hardly NOT ask the question: Can’t you tell us any stories about your career?